Nehari recipe by nidaqadri at PakiRecipes.com. First boil meat in water on the stove (ask butcher to cut ghosht into big pieces) add ginger and garlic paste. When the meat is tender and soft in another pot put a little bit of oil and add Laziza Nehari Mix. Only put the meat in. (DO NOT THROW THE WATER AWAY) Mix properly. After mixing add half of the water that was in the pot with the meat. (STILL DO NOT THROW AWAY THE REST OF THE WATER). To the water that was left over add 2 or 3 tablespoons of flour and mix. Mix properly so there are no lumps of flour left. Then add the flour and water mix to the other pot with the meat and masalas. (WHEN ADDING THE MIX TO THE OTHER POT MAKE SURE THE STOVES TEMPERATURE IS REALLY HIGH OR THE MIX WILL TURN IN TO BALLS AS SOON AS IT TOUCHES THE GHOST AND MASALA, AFTER ADDING PUT THE STOVE ON SIMMER) Mix properly. The flour and water mix will add a thickness to the dish. After doing this process leave the stove on simmer for 30- 40 minutes. Stir occassionaly. 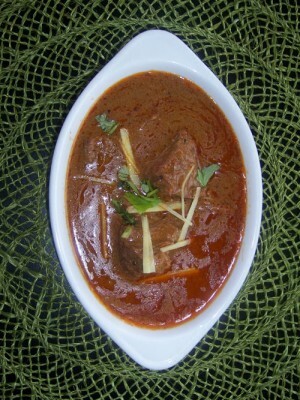 Heat oil in pan and then garnish the Nihari with it. Garnish fresh thin slices of ginger , green chilies and lemon in the end. Enjoy!!! Every one know how to cook food with packet masala. Please only post original recopies. I was very disappointed to find that recipe is based on a packet masala. ermmmm i thought its the actual recipe...with NO packet masala:)can u plz share that one?